What would happen if we valued our spouses? What would happen if we publicly valued a faithful wife more than a voluptuous starlet? What would happen if character was valued more than money? I believe it would transform our culture, enhance our marriages, and produce stronger and better adjusted children. I know God would be pleased! Thank you, Holy Father, for the great women of faith I meet in Scripture. Thank you for the godly women I've met in your Kingdom. 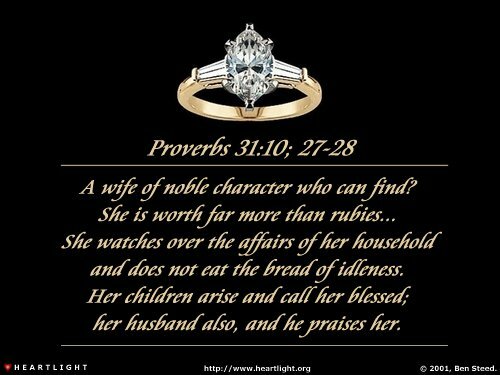 Please use me to show that I value godly women in my life, especially those who are wives of virtue and godly character. In Jesus' name I pray. Amen.